It's not stalking if you have a licence: Why bother? I have to admit, Dear Reader, that I have been a little remiss with updates recently. I can't really say that I've been all that busy, hence my silence. The truth is that circumstances are becoming a little dire - very few new clients and several current recurring clients are closing down their respective operations so no more future work from them. Not very happy days at all. And then there are those 'clients' like Velma. 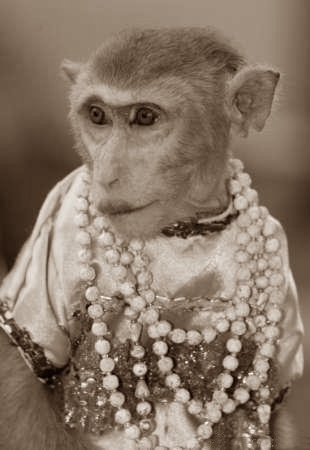 I'll have to apologise as, while morosely pondering the sad state of affairs my life had become, I described Velma as 'a monkey wearing lipstick and a dress' to a friend recently. Not very gallant of me but I'd just had a call from Velma where I tried to let her down gently and, if you remember, without actually charging her any money, that there was no merit in pursuing her case. I had seen the advert she was referring to (the Ab Circle Pro) and the woman running into the ocean surf towards the end was NOT her, 30-odd years ago, filmed without her knowledge or permission. Was that good enough for her? She was, in fact, quite disappointed and still could not believe that the person in the advert was not her. Also, she believed there were a number of other images of her that she had seen in various Women's magazines back in the 1980s. Could I possible find them? Given that there are a number of such magazines, most published weekly, and the 1980s being a fairly broad time period, I stated that this would not be a good use of my time and that she could do most of this herself at a public library. Naturally, I sidestepped the issue that the odds of any such photographs actually being her were statistically insignificant given that she is a deluded individual with a life of no interest to anyone who buys glossy gossip magazines. No doubt this saga will continue but hopefully without me.